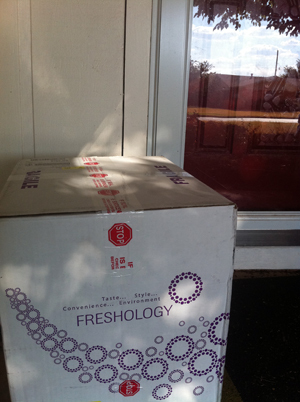 As I mentioned in my Menu Plan Monday post, I’m going to be doing Freshology meal delivery for the next two months. 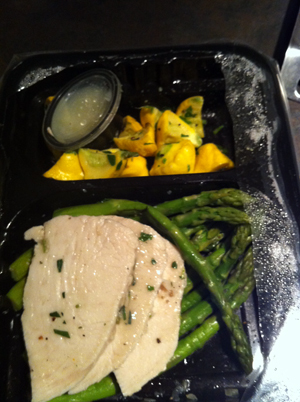 I got my first shipment yesterday afternoon and started eating the meals today! Right off the bat I’m impressed with Freshology’s customer service. I get an email with a tracking number for each shipment, so I can know exactly when the food is delivered. Prior to receiving my first shipment, I got a link to a menu letting me know what foods I’d be eating each day, along with the nutritional information. I also got a short survey to give feedback on my impressions so far. It’s apparent that they really want to make their customers happy. Today was an interesting/challenging day to start, because we had J’s birthday party tonight. I was good and didn’t have any of the pizza, cake, or soda. In a way I’m glad this was how I started off my experience, because challenges like the party tonight are where I tend to slip up and eat things I shouldn’t. Some people say they’re social drinkers; I’m a social eater, I think! I was busy enough doing things that it didn’t seem too bad to miss out on cake. Let’s talk about food – I know you’ve got to be curious! 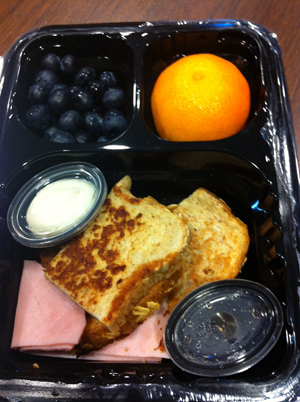 I heated up the toast and Canadian bacon in the microwave at work, and this made for a filling and delicious meal. The syrup wasn’t thick and gooey like I’m used to, but mixed with the vanilla spread I still got a sense of richness that makes french toast so good. I was really impressed with how fresh the fruit was. This is definitely a better breakfast than I normally eat! It was a nice blend of savory & sweet, too. Another hit. I’ll be honest and say that at first I couldn’t tell where the chicken was; since it was marinated in basil sauce and was green it kind of blended in with the cucumber salad it was next to! Once I figured it out I was incredibly impressed with this lunch. I didn’t even use the dressing that came on the side, because everything was so flavorful on its own. The cucumber salad was nice and crisp, too. I enjoyed having the dried apples to finish things off – it was a nice little treat. Since I was eating this at home after the party I decided to plate it before eating. I was glad I did, because it was amazing to me how much food there was! Once again, the quality of everything was top-notch. 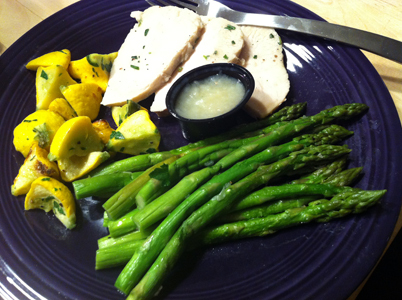 The seasoning of everything was perfect; the turkey and squash were tender, and the asparagus was just slightly crisp. I’m not a huge asparagus fan in general, but C kept coming over and snagging stalks from my plate! This photo doesn’t do the dessert justice – it was SO good! 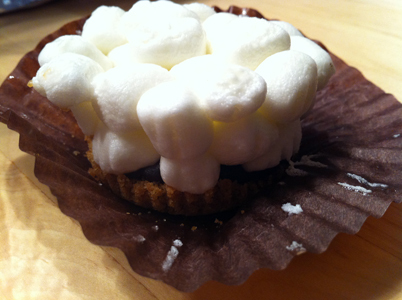 The crust seemed like a graham cracker crust, then there was a layer of chocolate and the top layer of marshmallows. This totally made up for the fact that I didn’t eat birthday cake at the party; in fact, I’d rather have eaten this than cake anyway. It was that good. All in all, this was a great day! I felt hungry mid-afternoon and ate a few slices of apple. Freshology mentions in their welcome packet that during the first two weeks it can be an adjustment to get used to smaller portions, and recommends some low-calorie options. I’m hoping to get to the point where I don’t need to rely on snacks, but if I do I’ll stick to something small and healthy. I got in a little exercise at J’s party jumping on the trampoline, but I hope to fit in more exercise on a regular basis – at least three times a week. I didn’t really have any struggles or temptations to stray today, and I’m ending the day feeling really motivated and excited about the two months to come. This seems like a really awesome program! The meal’s look like they are delicious! I’m excited to see your progressive! Stay motivated! You got this! Thanks Casey! I have been really impressed with the food so far – it definitely makes it seem like this will be easier to stick with than things I’ve tried before! Thanks Chandra – and way to go with avoiding cake last night! I have heard of Freshology before and I have always been very curious about it. I cannot believe how FRESH the meals actually look! They look like something you made yourself (well, if you were a gourmet chef of course). I haven’t had breakfast yet and I was looking at the photos in your post and I think I’m DROOLING! It looks SO GOOD!!! I need to lose weight. Freshology looks A LOT better then powdered drinks and mass produced frozen meals. I’m excited for you and I can’t wait to see more of your posts. What a great review opportunity. I’m jealous! LOL! 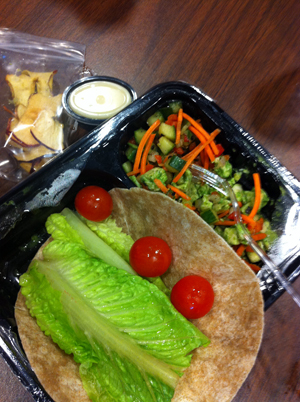 The food really is amazingly fresh – I’ve never been attracted to programs where I have to drink shakes or eat bars, etc. because that is in no way something I’d ever stick to long-term. With this I’m eating real food and learning to eat more reasonable portions along the way! I’ve never heard of this program. The food looks really good, like it was made at home! I’m interested in reading more about your experience with the plan!